Click the button below to add the Decorative Toilet Seat "Blue Green" to your wish list. A Mexican toilet seat with a blue, green and orange pattern is quite decorative. The lid #HM33 will draw immediate attention to its pattern and amaze anyone entering the bathroom. 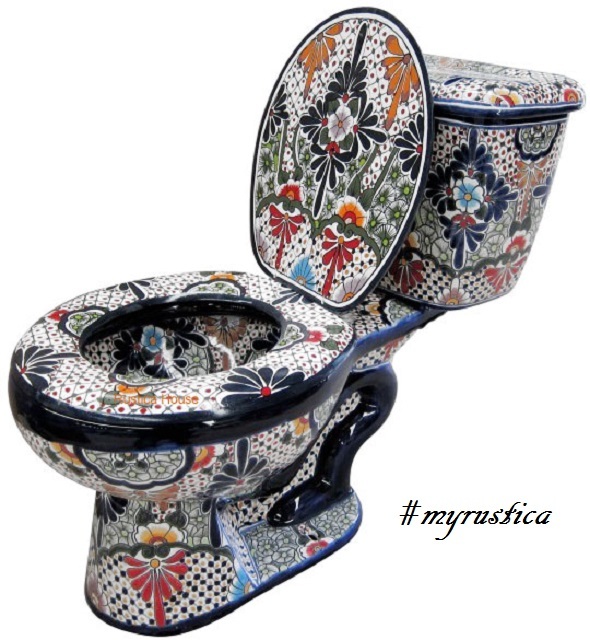 Colors used by the artisan for decorating this toilet seat create unusual atmosphere. Rustica House bath accessories are handcrafted in Mexico, it takes four weeks to deliver them abroad. The Mexican toilet seat 7HM33 is available with WC, bathroom set and wall mount accessories with matching pattern. Shop our Bathroom category and save on combined delivery.